Pierate - Pie Reviews: Pie for Every Meal - My British Pie Week Challenge! Pie for Every Meal - My British Pie Week Challenge! 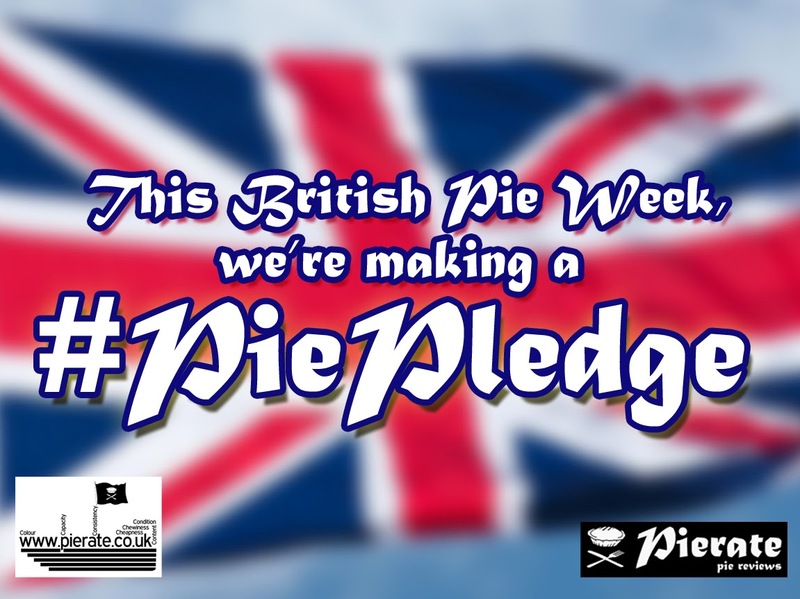 At Pierate we are encouraging people to take up a #PiePledge for British Pie Week. It can be anything a bit unusual to do with pie. Like British Pie Week itself a #PiePledge can help raise the profile of our favourite traditional British pastry product. Last year I went a whole day eating only pies. I wasn't allowed to eat anything with the pies and consumed a total of 11 pies and 3362 kcal! This year I want to do something a bit more balanced. There is a sentiment that pies are unhealthy which we believe is unfair. At Pierate we eat a lot of pies and we're a pretty skinny bunch despite having reviewed over 340 pies! (If you don't believe us just see our photo on the About Us page!) Part of the problem is that pies are not always combined with a balance diet and active lifestyle. I want to show that you can eat a lot of pies without becoming obese. I am therefore going to have PIE FOR EVERY MEAL during British Pie Week to make a total of at least 21 pies. I am going to do this whilst still getting my 5 portions of fruit and veg a day and a balanced diet. Just think about it, Pork Pie and salad or a Steak & Ale with mashed swede, you can have both nutritious and delicious! Then let us not forget that pies can have a variety of filling, many of which are healthy is their own right. I will carry-out a daily weigh-in to show that (hopefully) there is no affect on my weight. This will be documented in our daily British Pie Week diary as we did last year and with regular Twitter updates. I also pledge to match my own my pie consumption with donations of tinned pie fillings, packet mash/tinned veg and ready mix pastry (all you need to make a pie meal) to Gloucester foodbank. This challenge is a bit of an unknown for me. I have an equal mix of excitement and trepidation. I am not sure if it will work but will give it my best shot. Follow my exploits on twitter with the hashtag #pie4everymeal. I would like to focus particularly on one or two pie suppliers, especially if they have a pie which is good for breakfast (a meal which could be a problem!). If you want to become one of the pie suppliers/sponsors for this challenge then do get in touch with @pierateers on twitter or just send me an email to pierate@gmx.co.uk. British Pie Week 2014 is from 3rd March to 9th March. Lastly, a personal plea to make your own #PiePledge. See what pledges others are making. This British Pie Week all the Pierateers and even the Ship's Cook are making #PiePledge commitments to brighten up the week! Click here to see them all!